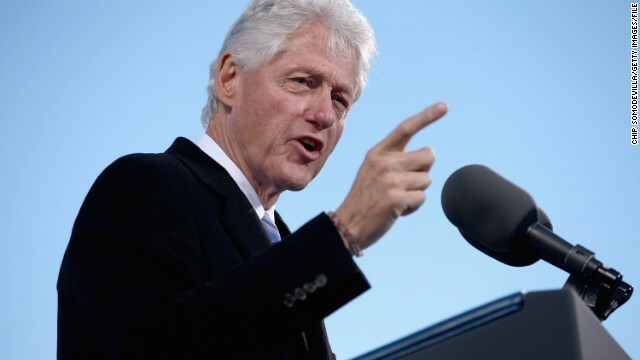 (CNN) - Former President Bill Clinton weighed in Monday on the legislative impasse at the heart of the government shutdown, admonishing the “constant conflict” that has come to define American politics. Speaking at a convention of the National Community Pharmacists Association in Orlando, Clinton said he liked the crowd because of the practicality of their profession. “I worry that our politics has gotten impractical. That’s about the nicest word I can think of,” Clinton said. Convictions are a good thing, Clinton said, as are political beliefs and support of one policy over the other. The comments are some of the first Clinton has made on the spat over government funding, debt and Obamacare since before the partial shutdown took effect October 1. In an interview with ABC at the end of September, Clinton took a hardline approach to the looming shutdown, calling on President Barack Obama to call a congressional Republican “bluff” on defunding the Affordable Care Act. Obama could have stopped the shutdown, Clinton said at the time. “But the price of – the current price of stopping it is higher than the price of letting the Republicans do it and taking their medicine,” he said. Clinton on Monday was far less confrontational and far more the elder statesmen who has seen and done it before, having been President during the last federal government shut downs in 1995 and 1996. Instead of conflict, Clinton urged cooperation. “Nobody’s right all the time. And the more complex problems are the more you need people to work together,” he said. But politics is often a zero-sum game where there are winners and losers and especially in Washington, working together is often far less attractive than some notion of winning. “Constant conflict is actually often good politics. Because the more you can inflame your supporters the more likely they are to show up at election day,” Clinton said. President Obama must stand firm against Republican pressure. We elected him to a second term because we did not want a Republican. Give em Hell Bill while Hillary is picking out her WH curtains. Coming from the man who gave us, NAFTA, the first world trade center bombing (Bin Laden 1993) and the Fannie and Freddie housing bubble in 1994 doesn't have any room to talk! ...embarassing! The Tea Party does not know how to govern, and Congressman who follow the Tea Party's warped ideology should be voted out of office. The current administration wants the poor to lash out violently when they don't recieve food stamps or any other handout so he can declare martial law when or if they riot for food. Clinton knows this. I’m a believer in Jesus Christ, as I look at the End Times scripture, this says to me that the leaf is on the fig tree and we are to understand the signs of the times. Then it makes total sense not to keep the Government Running ? Mr.Bill Clinton is perhaps one of the few statesmen whose opinion carriers a lot of weight in present day situation in the United States, which was one of the most prosperous and powerful state in the world under his tenure. His suggestions should be carefully studied and implemented to correct the impasse. Well there Mr. president: It is nice to see a fire and anger at your own political party that has induced Communistic directives that reduces the well being of the United States. You are correct sir that spite from one man or maybe two due to an arrogance of figure has no place. No matter, your words spew out, but no further. A Capitalist (Imperialist) nation cannot have 1/3 of its population on Government subsidies and expect progress let alone prosperity. Careful, the rest may throw in towel. Obama is the problem. Both he and his voters hate America. Easy for Bill to say. He was at loggerheads with the Republicans much of his two terms. In fact, they tried to impeach him! How soon we forget. Oh Bill, you job-exporting elder statesman for globalization. Politics in a republic is just like theology. It is faith based -faith in your representative. Faith that your single vote will make a difference. And anything faith based is irrational and can be manipulated. Thought they taught that is lawyer school. One need only look at the State of the Union speeches to determine the source of the divide. Not until President #44 has there been repeated negative references to the other party. Translation: do what MY team wants! Conflict, though painful, is the best way to have a good outcome!